Do you find just going out for dinner a little passe sometimes? Or maybe you enjoy theatre and comedy shows but get distracted by your insatiable hunger? 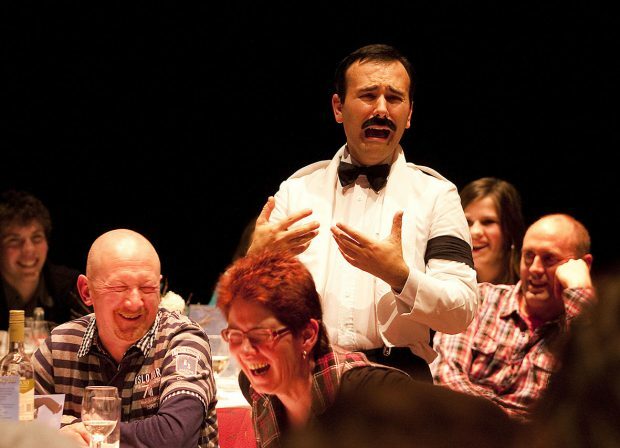 Well, Faulty Towers The Dining Experience is here to make both experiences not only bearable, but enjoyable. Laughable, even. Beginning over 20 years ago, the immersive theatre/ comedy/ restaurant experience has touched all four corners of the globe serving up delicious evenings of laughter with their unmatched recreation of the classic BBC Series. BRAYDEN EDWARDS caught up with Alison Pollard-Mansergh from the Team Faulty to find out about some of the most bizarre experiences and locations in the show’s colourful history and why it’s one FRINGE WORLD event not to be missed as they perform at Rigby’s Bar on St George’s Terrace from February 9 to February 25. Firstly, this is such a unique kind of performance and really unlike anything else at Fringe. Where did the idea come from and how did it come together? I’d started developing a show based on Fawlty Towers with an actor who’s still playing Manuel with us, Andy Foreman – basically because we both loved the TV series. We both had improvisation, acting and writing skills, and I had owned a restaurant at one time, so we had the idea of basing the new show in a “Faulty” restaurant. Also, we both loved the idea of bringing theatre to people “who don’t like theatre” – and we knew that everyone likes to eat out and have a laugh – so to make a show that revolves around a meal really took root. 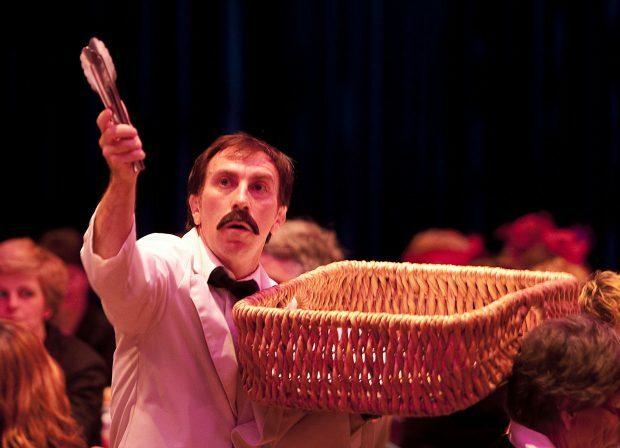 The first outing for Faulty Towers The Dining Experience was in Brisbane in April 1997, and it’s still growing every year – changing all the time, of course, because so much is improvised. And how do the cast prepare themselves for being part of the show? Are they just required to watch every episode of Fawlty Towers religiously to get to know the characters inside out? They must watch every episode to learn all the nuances and tics of their character, and then they’re required to sit in at least five shows with our performers to see how it works on the floor. They’re seasoned professionals in terms of acting, but they must also be able to improvise in character 70% of the time during the 2-hour show. So rehearsals tend to take the form of workshops and games that are designed to make the actors’ reactions quicker and sharper while maintaining their role’s original character and voice. How do you go about deciding what venues or restaurants to hold the Dining Experience in? What is it that you look for and why Rigby’s Bar for the FRINGE WORLD series? We have practical requirements like sufficient performance space between tables, clear sight lines, good acoustics, and easy access to kitchens. Rigby’s has all of that – and importantly, it also has an owner and staff who love the idea of getting people through the door to have a good laugh and a good time. People right across the world including Scandinavia, Singapore, Antigua and Kenya have been able to enjoy the Dining Experience. How does the show adapt to the different kinds of food and culture in such diverse places? It adapts well everywhere we go. We work with the venues so that the food served fits our runsheet but also caters to the taste of the locals. And in terms of culture, we make sure that local customs are observed. It takes a bit of research and adaptability, but it’s pretty straightforward. And what was the most bizzare location the show has been held in? There have been a few! HMS Victory in the UK was tricky (all those gangways…). The tropical garden of a Barbados polo club where the chef forgot the soup starter was fun. But probably the weirdest is the marquee in the rustic car park of a Kenyan mental asylum turned B&B called The Purdy Arms, with armed police outside the door! Are there favourite moments or scenes from the original TV series that provided inspiration for these performances? They’re all classic, but it’s the way the characters are portrayed throughout the series which is so inspirational. Like Basil’s fawning as well as his out-of-control rants, Sybil’s laugh and calls for “BaaaaZEEEEEL!” And of course poor put-upon Manuel’s bemusement the whole time. Have you ever had the chance to give one of the original cast members their own dining experience? Actually yes! Andrew Sachs came to one of our London performances and he and our Manuel at the time, Leigh Kelly, had a ‘Manuel-off’. The audience loved it! He was a complete delight.